“Through a half-dozen or more books, Jack Nisbet has shown himself to be an astute interpreter of Pacific Northwest history, an insightful naturalist and an excellent storyteller. Two of his earlier books, “Sources of the River” and “The Collector,” brought the epic work of Hudson’s Bay Company explorer David Thompson and naturalist David Douglas into contemporary focus. 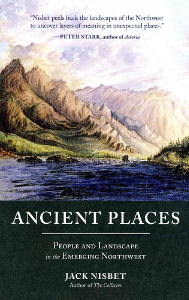 His new book of lively essays, “Ancient Places: People and Landscape in the Emerging Northwest” (Sasquatch, 256 pp., $21.95) engages the past and present of the Inland Northwest. Landscape and its pivotal role in the history of the region have been a primary concern for the Spokane-based author. In these essays, specific Northwest places — the track of ice-age floods, fossil beds of the Okanogan Highlands, traditional native fishing grounds at Kettle Falls — become central characters. Nisbet lets his curiosity range widely here. He tracks historic records of the largest meteorite to land in the Northwest, a 15-ton monolith half-buried in Northwest Oregon, and the nutty if herculean scheme of its discoverer to winch it onto his property, where he charged the curious 25 cents to view it. The meteorite now rests in the more dignified confines of the Museum of Natural History in New York. Earthly metals were the objective of mining engineer William Manning when he traveled to Idaho’s Salmon River country from his native Ontario in 1897. Along with pursuing a successful mining career, he befriended Chief Joseph, the legendary Nez Perce leader, Chief Masselow of the Kalispel tribe and other notable tribal leaders. Through gifts and acquisitions Manning became one of the principal collectors of Native American artifacts in the inland Northwest. His collection forms a significant part of the Northwest Museum of Arts and Culture in Spokane. Nisbet combines historic research with field work, personal interviews, and the kind of local knowledge that is gained only through decades of living in a place. He pays attention to stories told by longtime residents and tribal people, as well as geologists, paleontologists, anthropologists and university researchers. Entomologist Laurel Hansen invited the author into her Spokane lab. The result, with Nisbet supplying historical background from fur trade journals and tribal stories, is an essay on thatching ants, those ubiquitous mound-building ants of the countryside that comprise the largest genus in North America. Another essay on biscuitroot, the genus Lomatium of the Blue Mountains, moves gracefully between natural history, historical accounts, interviews with contemporary Native Americans and personal rambles. Seattle readers will appreciate a delightful piece on the late Wes Wehr, painter, composer, memoirist, friend of artist Mark Tobey and poet Elizabeth Bishop, and affiliate curator of paleobotany at the Burke Museum. A self-taught enthusiast, Wehr’s field discoveries helped place the Okanogan Highlands on the map for its world-class fossil beds, and he had at least one ancient plant named for him. “Jack Nisbet has been writing about the landscape of the Inland Empire and Pacific Northwest for many years. In his books about David Thompson and David Douglas, the author did extensive research into the written records left by these early settlers. Now he goes one step further to seek modern information about the Ice Age Floods, the Willamette Meteorite, the 1872 Earthquake, the aurora borealis, and rich deposits of terra cotta clay—the genesis stories of the region. In the opening essay called “Chasing Electric Fluid,” Nisbet explores David Thompson’s 1792 reports of a possible meteor falling to earth where he saw mysterious glowing lights. John Phillips, a NASA astronaut aboard the International Space Station, wrote Nisbet to tell him, “that your book has been doing some traveling.” Phillips was interested in Thompson’s aurora experiences and that lead to camera shots of waterways with luminous reflections sent from space in 2005. When I placed one of David Thompson’s maps next to Phillip’s image, all the same elements marched across the page, from the mountain ridges on each side of the nascent Columbia’s valley to the low divide that allowed the Kootenay River to rush south while its mother river began a much longer journey in the opposite direction. Thompson, with only tribal information and his own survey data, had created a bird’s-eye view that jibed remarkably well the camera’s stark image. “Longest Journey” recalls the odyssey of the Willamette Meteorite discovered in 1902 by Ellis Hughes. There was wide interest to purchase and display the meteorite from the Smithsonian, the St Louis World’s Fair and the 1905 Lewis and Clark Exposition. Court cases over the legal ownership of the object—be it an abandoned Indian artifact or from Mars—gave custody of the meteorite to Oregon Iron and Steel. In 1986, Richard Pugh, a Portland high school science teacher, theorized that the meteorite originally plunged to earth millions of years ago in British Columbia or Montana. During the ice floods the rock was carried downstream across the Columbia Basin where the ice floe came to rest near the mouth of the Tualatin River. More bidding, studying and relocating occurred until, in 1990, the Willamette Meteorite became the centerpiece of the American Museum of Natural History’s new Cullman Hall of the Universe, with the permission of the Grand Ronde people. …if the Willamette Meteorite is ever retired from public display, its ownership is to revert to the tribes. It is possible, therefore, that at some future date the turtle-shaped stone will once more journey across space and time, echoing one brief chapter of its long history. If it should travel by rail, it will retrace its climatic Ice Age voyage across Lake Pend Oreille, through Spokane, and down the Columbia as it makes one more partial orbit of our small planet. Thus begins “Restless Earth.” The five lines had been copied from a wooden headstone at the Washington State Penitentiary. Clues surface in the 1970s, when the Washington Public Power Supply System commissioned a study of the 1872 earthquake. The report published in 1976 gave no doubt that a major quake had occurred, with a 7.0 to 7.3 magnitude with an epicenter located on the west slope of the Cascades possibly 50 miles north of Lake Chelan. In 2002, Ralph Haugerud, a US Geological Survey researcher re-evaluated the previous report. He determined that a 6.8 magnitude quake occurred with the epicenter east of the Cascade Range and close to the south shore of Lake Chelan. With both reports, it was established that a powerful earthquake occurred in 1872. As to the identity of the person buried in Walla Walla, many ghost tales of the Spirit of Whist-m-la’s mother have been passed along to Ann McCrae. Perhaps soon the legend and the truth will come together.